Python Detectors will detect signals from "all directions" (360 degrees), including Hidden, Reflected and Diffracted transmitted radio frequency signals from a stationary or mobile emergency service vehicles, that are nearby or obscured by buildings or other objects and therefore not in your direct line of sight. Python Detectors are "Passive Detectors" and do not generate any transmitted radio frequency signals and therefore cannot be detected by other emergency service vehicles or detection devices. R.A.D.A.R Detectors meaning (RAdio Detection And Ranging) use a "Active" superheterodyne receiver where the radar detector's receiver's local oscillator radiates slightly which could be detected by a Radar Detector detector. Radar Detector Beams are Line of Sight and only operate in "One Direction". A Radar Detector needs an unobscured view of the targeting Radar Gun to alert the driver of a possible targeting event, by which time a Radar Detector alert could already be too late. 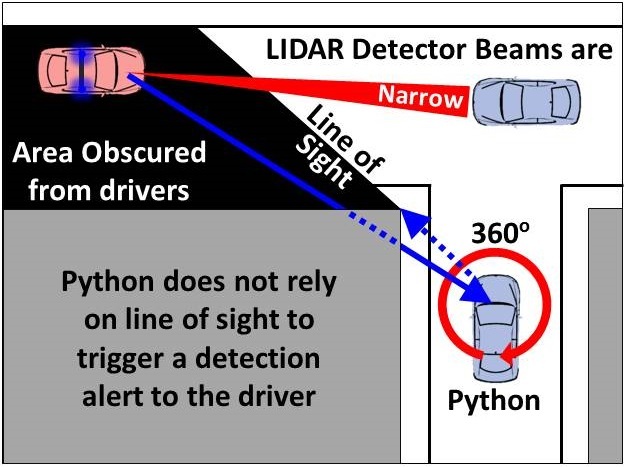 Python can virtually "See Around Corners"
L.I.D.A.R Detectors, meaning (LIght Detection And Ranging) are a newer speed detection device and use a pulsed laser light, where the Speed Guns uses light in extremely fast pulses to detect the drivers speed. The LIDAR Beam is very narrow and over a distance of 300 Metres only expands approximately 1.8 Meters, whereby a Radar Beam can expand to approximately 26 Metres at a distance of 300 Metres. Python Detectors are a R.F.P.D Detector meaning a Radio Frequency Power Detector and will provide the driver an audio and visual alert when it detects the transmitted signal from an emergency services Radio in the frequency range of 380-385 MHz. Python Detectors do not rely on line of sight to trigger a detection alert so they can warn the driver of approaching, nearly or hidden Emergency Services Vehicles. Python does not rely on "Line of Sight"
Python Detectors are not RADAR or LIDAR Detectors. 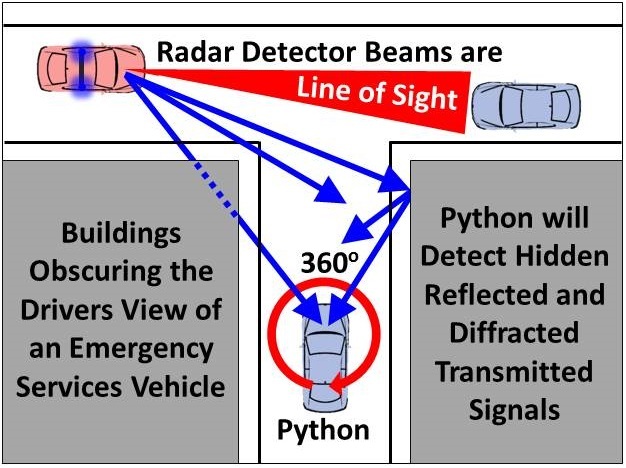 Python Detectors do not rely on RADAR or LIDAR targeting to alert the driver of approaching, nearly hidden or hidden Emergency Services Vehicles. Python is a R.F.P.D Detector meaning a Radio Frequency Power Detector and will provide the driver an audio and visual alert when it detects an transmitted radio frequency signal in the frequency range 380-385 MHz. This frequency band is specifically allocated for emergency services radios which use the TETRA standard in the UK. Python Detectors will provide a warning alert when they detect a transmitted signal from the Radio of an Emergency Services Vehicle. The Emergency Service Vehicle Radios constantly transmit their location to the network and a Python Detector will detect these transmissions. This means that a Python Detector can register a detection from an Emergency Service Vehicle which may not be involved in speed awareness detection and which is not in your direct line of sight. ✔ Python Detectors do not need Line of Sight to operate. X Radar and Lidar detection works based on Line of Sight. ✔ Python Detectors will detect Hidden, Reflected and Diffracted transmitted radio frequency signals obscured by objects and buildings. X Radar and Lidar Detectors need an unobscured view of the targeting Radar Gun to alert the driver of a possible targeting event. ✔ Python Detectors are "Passive Detector" and do not generate any transmitted radio frequency signals which can be detected by other emergency service vehicles or detection devices. X Radar Detectors use a "Active" superheterodyne receiver where the radar detector receivers local oscillator radiates slightly which could be detected by a Radar Detectors detector. ✔ Python Detectors in normal operation are not subject to false alerts as the receiver is designed only to detect the Radios of Emergency Service Vehicles in the frequency range of 380-385 MHz. X Radar Detectors can be subjected to false alerts caused by some shop automatic door systems and other type of radar system such as vehicle blind spot and distant monitoring systems. ✔ Python Detectors can be powered from the Vehicles 12V DC auxiliary power socket or the internal battery. In both modes the detection performance is the same. Under normal use when using only the internal battery the operational mode is approximately 2.5 hours. X Radar and LIDAR Detectors are mainly powered from the Vehicles 12V DC auxiliary power socket due to the power requirements needed for a good level of detection. Some battery powered Radar or LIDAR Detectors would have less detection performance and range. ✔ Python Detectors have a unique and fully integrated windscreen mounting bracket located at the rear of the detector for securely fitting the detector to the vehicles windscreen. X Radar and LIDAR Detectors are mainly supplied with a separate windscreen mounting bracket that has little flexibility to cater for different mounting options.